The Bible text about the Ark of the Covenant is Exodus 25:10-22. ARK OF THE COVENANT: Below is an artist concept of the Ark of the Covenant that was in the Holy of Holies. This drawing is by Brent Kington a Christian who is also a noted artist and metal smith. He has interpreted the Bible text in light of practical metal working of ancient times. The Ark of the Covenant is described as a box of gold covered wood with a gold covered top and gold cherubim. We do not know what the cherubim looked like other than the fact that they had golden wings spread over to cover the ark. The Bible describes the ark as gold covered rather than solid gold. To have been solid gold would have made it too heavy to carry. Even so, the ark had to be solidly constructed because it contained the stone tablets of the ten commandments, the jar of manna and Aaron's rod that budded. Gold covered wooden boxes with rings for carrying poles were also found in King Tut's tomb and give us an idea of construction similar to the Bible ark. As the craftsmen of the Israelites were likely trained by the Egyptians it is not surprising to see some similarities in construction style. A common error of modern artists is to have the rings for the carrying poles at the top of the ark. Exodus 25:12 states that the rings were fastened to the feet. We have shown the rings inside the feet instead of outside the feet as this would have been much more structurally strong for holding up the box containing the stone tablets. Since a cubit is approximately 18 inches the Ark was some 45 inches wide and 27 inches long and 27 inches tall. Other features of Kington's design are include the arrangement of the poles. We have the poles perpendicular to the ark rather than parallel to the long side of the ark. This is more stable and has the correct width for someone to carry the poles shoulder width. This design meets the Bible text and is very portable, beautiful and practical. Brent Kington is a Christian and renowned metalwork artist. His insight into ancient metalworking techniques were instrumental in his depiction of the furnishings of the Tabernacle. This drawing by Brent Kington. (2003) - click to enlarge. 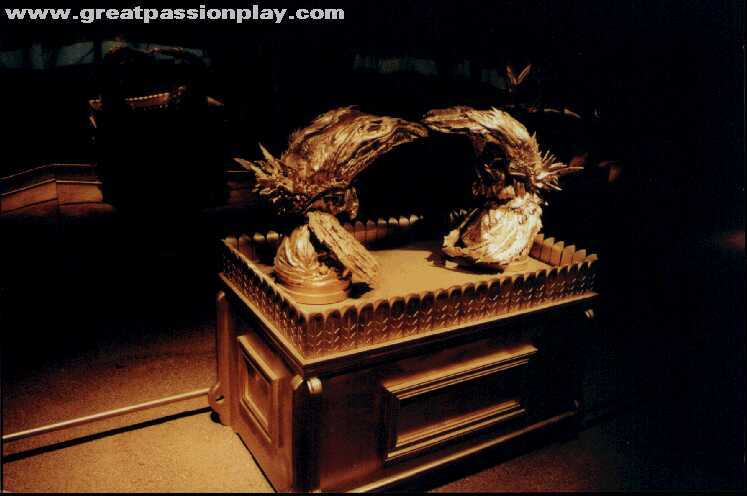 Left is a picture of the Ark of the Covenant as envisioned by the folks at "THE GREAT PASSION PLAY" who built a full scale model of the Tabernacle. You can use this image for comparison to our concept. As you can see when comparing Kington's drawing with the model that there is some difference in interpretation. Visit the site below to see a picture of a gold covered wooden box with feet and rings for carrying poles that was found in King Tut's tomb. Although this was not the Ark it does give us an idea of what ancient Egyptian craftsmen made that may have been similar to the ark. This is particularly significant considering the fact that we would expect that Hebrew craftsmen and Egyptian craftsmen may have used similar techniques due to influencing each other during the time that the Hebrew people lived in captivity working in Egyptian just prior to the Exodus and building the ark. Visit the photo at: King Tut's Tomb Furniture. The Ark of the Covenant wall chart shows the most important part of the Tabernacle and the Temple. God instructed Moses to place the Mercy Seat and the Ark of the Covenant in the Tabernacle. It stood in the Most Holy Place (the "Holy of Holies") where God spoke to Moses. The artist's illustration is drawn from the description found in Exodus 25. Reproducible worksheets on the back. 19.5" x 26". Journey to the Promised Land, where Joshua has led the children of Israel! Now it's your job to develop the area with roads, cities, and temples. You also need to raise sheep, deploy prophets, and carry the Ark to outlying areas. Old Testament adventure, fashioned after the hit game Carcassonne. Two to five players, ages 8 and up.